The girls say they are trying to get the most out of this post-London euphoria. The duo insist they're not tired or homesick, despite going weeks before making their way home late this week. They've been on a whirlwind tour since the Olympics — from "Late Night With David Letterman" to the Empire State Building and the New York Stock Exchange — but gold-medal gymnasts Gabby Douglas and Jordyn Wieber have one more stop to make before they can truly take a breath: the White House. President Barack Obama made the invitation in a phone call. "We'll definitely take him up on it," Douglas said. The girls say they are trying to get the most out of this post-London euphoria. Long days of interviews, autographs and photo ops haven't left them jaded. "Were enjoying every step of the way," said Wieber, who with Douglas, McKayla Maroney, Kyla Ross and Aly Raisman gave the United States its first Olympic team title in women's gymnastics since 1996. 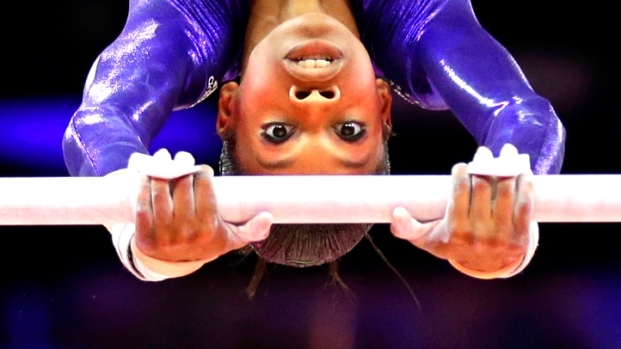 Douglas also won the women's all-around individual gymnastics competition. They insist they're not tired or homesick, despite going weeks before making their way home late this week. Wieber says she has jammed pretty much everything she owns into four suitcases, including her own pillow, and hasn't looked back. "We've been having so much fun the past few days," agreed Douglas, who has Tweeted photos of herself meeting Nicki Minaj, Karmin and Nick Cannon, and also has savored online congratulations from Justin Bieber and Taylor Swift. She shared a couch with first lady Michelle Obama on "Tonight" with Jay Leno. She is still waiting for her invitation to appear on "The Vampire Diaries," hands-down her favorite TV show. Wieber? She'd like a little gig on "Teen Wolf." Douglas and Wieber are still girls, and they acknowledge not being fully prepared for all the attention and publicity they've received over the past few weeks. Douglas is 16, and Wieber 17. "I don't think anyone expected this. ... I didn't expect this," said Wieber, of DeWitt, Mich. Instead of making back-to-school plans for the fall, they're gearing up for the 40-city Kellogg's Tour of Gymnastics Champions. "Not many 17-year-old girls get to do this, so I don't feel like were missing much," Wieber said. Douglas, who lives and is home schooled in Des Moines, Iowa, to be near her coaches most of the time, would just like to have time to do a little light gymnastics training in the interim before the tour — and maybe try a CrossFit conditioning workout that emphasizes endurance and cardio. "We all want to stay in shape," she said. During the Olympics, they did their own hair and makeup for all the competitions — and those millions of photos. As a team, sometimes they'd critique themselves, Douglas said, deciding the next day to lighten up on the eyeliner or wear more blush. But they didn't pay much attention to any critics of their appearance even as Douglas' slicked back half pony-tail became the talk of the Olympics. Douglas, who on Thursday wore her hair loose and flowy, said while she loved the transformation the pros give to their look, she, Wieber and their teammates decided they sort of like it better when they do it themselves. "Sometimes," Douglas said, "it just looks a little bit more like us."